Per Kirkeby (1 September 1938 – 9 May 2018) is one of the most internationally acclaimed Danish artists today. Kirkeby is best known for his paintings and brick sculptures, however the many different types of media and approaches Kirkeby worked with reflects his limitless exploration of art forms and the energy with which he worked. His works have great immediate visual accessibility, and he stated that “art and the power of the image are always up for discussion in the existential space where the artwork meets the viewer”. Kirkeby´s constant search for possibilities and challenges within art was evident in both his writing on the subject, as well as his ability to open up every visual media; painting, sculpture, printmaking, film, set design and monumental public-art commissions. As a young teen, Kirkeby was sent by his father on trips to Moscow, Berlin and Warsaw as a part of a communist youth group. He attended Grundtvigskolen high school in a working-class area of Copenhagen, where already then gravitated towards art, but ended up choosing to study geology at the University of Copenhagen instead. During his studies he developed his drawing talents while on school field trips to Greenland in 1958 and 1960. In 1962 Kirkeby became a mentee to Danish conceptual artist Poul Gerners, and joined Gerners´ Experimental School (of Arts). There he embraced the avant-garde fluxus movement (rebelling against the commercial art market, elitism, and the conventions of both art and society, with roots within Dada, Futurism, and Surrealism). Although Krikeby was mostly self-taught, his participation in The Experimental School, greatly impacted his career. By the time he graduated from university in 1964, he had already travelled to Düsseldorf, to take part in a sound work, “Siberian Symphony”, by Joseph Beuys, which also influenced Kirkeby´s artistry further. Kirkeby was awarded an artist Grant from the Danish government which aloud him to artistically experiment further, while continuing his geological work. Though dyslexic, he then went on to publish several collections of poetry, a novel and a book of essays in 1965 while on a meteorite expedition to Greenland. In 1967 he travelled to New York with Korean-American artist Nam June Paik, credited as the founder of video art. Inspired by Andy Warhol, Kirkeby produced his first short film in 1968, which was a portrait of Birgitte Bardot. Similarly his paintings around this time were also influenced by pop art, evident in his first exhibition, at Den Frie artist’s association in Copenhagen in 1964, which included “Car Pictures”, a single work over four panels. In the 1970s Kirkeby began to embrace painting and its history, creating an individual style of neo-expressionism, of which he is so well known for. His works were loosely influenced by the German painting scene of Baselitz, Penck, Markus Lüpertz and Jörg Immendorff, all of whom brought a renewed emphasis on formalism and painterly technique to an art world which had, nearly given up on their medium. In the 70s Kirkeby moved towards working with a wide range of media, and exhibited his first large-scale brick sculpture, in Ikast, Jutland. The work that combined Danish red brick with Mayan architectural design, inspired by a trip to Central America two years earlier. Most of his brick works are referred to as “buildings without purpose”, and are located throughout Europe; outside the German National Library, in Frankfurt, the DR Byen station in Copenhagen, and as a series of five interconnecting arches and windows built on a grassy slope overlooking a fjord in the Nordland, Norway, amongst others. 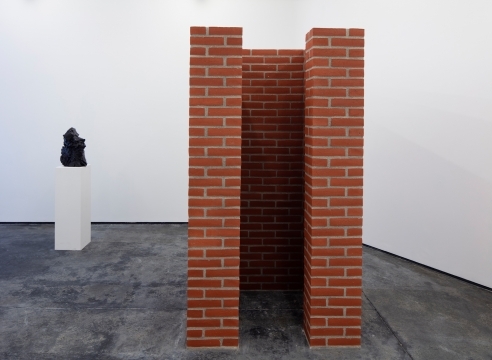 Although commonly viewed as a minimalist counterpoint to the artist’s neo-expressionist paintings, Kirkeby´s acclaimed brick sculptures are not minimalism. They relate to the specific history within Danish architecture tradition, and are places in public space, places of contemplation where changing and light and darkness may arrive. Inspired from his studies of geology, the sculptures are regarded as outdoor sculptures, celebration nature and weather. It was during this period of the 1970s that his career started to pick up pace internationally, first within Europe and then in the United States. Louisiana Museum became a loyal supporter of Kirkeby´s art and the museum today has the largest collection of his artworks worldwide. Kirkeby rose to fame during the early 1980s alongside fellow European Neo-Expressionist, and began receiving immense critical attention internationally. Kirkeby´s pop inspired, figurative art works form the 1960, filled with dreams and desires, stands in contrast to his partly abstract paintings from the late 1970s. The medium of painting was not about expressionism or self-expression for Kirkeby, on the contrary, he strived towards creating a situation not unlike that of nature, where existence; life, death, time, light and darkness, would be portrayed and explored, both for the painter and his audience. While his works onwards from the 1970s varied between abstraction and landscape painting, often within the same painting, his canvas retained an organic palette throughout. Comparably, his bronze sculptures, which he started making in the early 80s, are both abstract lumps and depictions of rocks he studied on the geology field trips he made throughout his life. Later in his carrier, Kirkeby´s paintings held elements of Christian iconography, filled with emblems taking part of an ultimate storyline; tree stumps reminding the viewer of the end of times, rocky mountains from the Byzantine practice with references to the crucifixion of Christ. These icons were never obvious but gave the painting character beyond the Kirkeby´s private incentive. In 1976 he represented Danish pavillion at the Venice Biennale (which he returned to do again in 1980, 1993 and 1997), and participated in two editions of Documenta, in Kassel, Germany, in 1982 and 1992. In 1985 he showed in a solo show at the Whitechapel Gallery in London. Kirkeby´s works were exhibited in a retrospective solo exhibition at Tate Modern in 2009. Bundesrat, Germany’s upper house, in Berlin, commissioned Kirkeby to create eight rock sculptures in 2000, and in 2005 he installed four bronze sculpture at Copenhagen´s new opera house. He has also created Murals for for the rotunda of the Geological Museum, Copenhagen, and the Royal Danish Library, as well as on the ceiling of the auditorium at Aarhus University. Kirkeby had close ties to the Danish film director Lars von Trier, and created title cards for several of his films in the late 1990s and 2000s. In 1999 he turned his focus to scenography and costume, creating designs for New York City Ballet’s production of the Swan Lake. Kirkeby´s works are held in collections such as the Art Institute of Chicago, The Museum of Modern Art in New York, the Tate Gallery in London, and the Louisiana Museum of Modern Art in Humlebæk, Denmark.